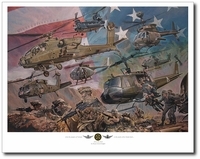 Image size: 18 1/4" x 25"
The McDonnell-Douglas AH-64 Apache attack helicopter is one of the most formidable weapons systems in the world. 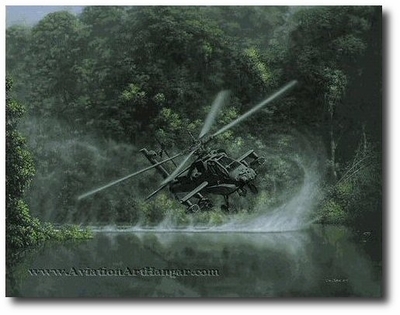 In "Deliverance", Dru Blair depicts the swift and sudden appearance of one of these agile fighters along a winding river in the first of his new Army Aviation Art Series lithographs. "Hands down the most totally effective attack helicopter in the world. Nothing, absolutely nothing, is in its class as a night fighter. It is nearly impossible to describe how it feels to fly and fight in this machine when it is bristling with its missiles, rockets and gun." Reproduced on 100 lb. Quintescence Archival Stock, each print of "Deliverance" is individually inspected and signed by the artist.